EAST RUTHERFORD, N.J. (AP) Andy Dalton and the Cincinnati Bengals missed another chance to get a statement win. A road game on Monday night against a winning team was an opportunity for the Bengals to reach .500 for the season. 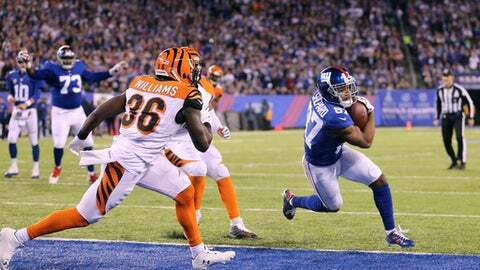 The Bengals faltered in the fourth quarter, though, and lost to the Giants 21-20 to fall to 3-5-1. The Bengals dropped to 11-23 on Monday night, including 4-7 in the Marvin Lewis era. The Bengals haven't won a road game on Monday night since the 1990 season, which was also the last season the team won a playoff game. The loss also continues the Bengals' struggles against the league's better teams in 2016. They also have lost to Dallas, Denver, New England and Pittsburgh. ''We've got to find a way to flip the switch and get these games turned into wins rather than a tie in London and a one-point loss here tonight,'' Dalton said. Penalties, an inconsistent offense and an inability to contain Eli Manning and Odell Beckham Jr. combined to foil the Bengals. Dalton was 16 of 29 for 204 yards with a TD pass to A.J. Green and an interception. The Bengals finished with only 12 first downs and 264 yards. The defense, which entered the game ranked 25th in the league, allowed 351 yards, and the Bengals were penalized nine times for 60 yards. Trailing 21-20 early in the fourth quarter, Dalton was intercepted by Landon Collins. George Iloka intercepted Manning on the next play, but the Bengals were unable to take advantage as they failed to get a first down. The Bengals were forced to punt on their next two drives as the Giants sacked Dalton twice. The fourth-quarter struggles overshadowed a strong start to the second half. The Bengals used Alex Erickson's 84-yard second-half kickoff return to get back in the game. Jeremy Hill had a 9-yard TD run and the Bengals later added Mike Nugent's 38-yard field goal for a 20-14 lead in the third quarter. But the defense couldn't hold the lead as the Giants went for it on fourth-and-goal from the 3 and scored on Manning's third TD pass of the game early in the fourth quarter to retake the lead at 21-20. Late in the second quarter, the Bengals missed an opportunity when they only mustered a field goal after Dre Kirkpatrick's interception gave them the ball at the 7. They were held to a 25-yard field goal by Nugent for a short-lived 10-7 lead. Manning then led a drive that ended with a touchdown pass to Beckham for a 14-10 lead at the half. With no team in control of the AFC North, the Bengals fell further behind in their hope to reach the playoffs for the sixth consecutive season. They host the Buffalo Bills on Sunday. ''We're trying to figure out what we need to do to have these outcomes be different and there's not one explanation for it,'' Dalton said.